1. Sewing on the buttons. 2. Finishing the raw edges left after sewing and cutting the steeks. Another option would be to handsew a ribbon facing over the raw edges, but I was concerned that these wouldn't have the give that the knitting does. The edges can be covered with crochet, but I wasn't certain how to do this. Finally I opted for the method Alice Starmore describes in The Celtic Collection. This involves a cross-stitching over the raw edges. The raw edges have been trimmed and I'm tacking them down with cross-stitch. 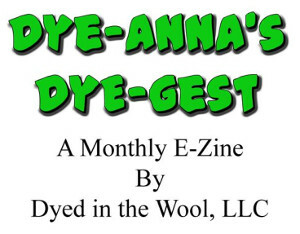 It's not easy to get a self-explanatory photo of, but hopefully you get the gist of what I'm doing. OK. I'll finish these little things up and then get a photo of the finished garment! I still love this sweater. Are you going to model it for a picture or have someone model it for you? 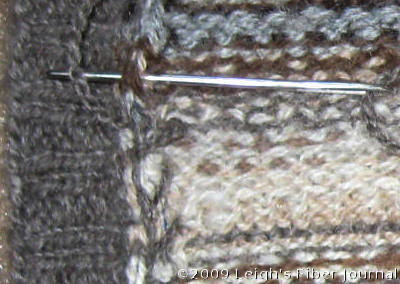 I so want to see the finished sweater, good luck with the finishing! Thanks for figuring this out and posting about it! I thought I'd get the last of Jim's sweater finished at knitting this week, but instead I hemmed a towel and didn't finish the sweater cuff. But then I'll have to do something about those steeks.....so I'll come back and look at this post again! Nice buttons by the way! 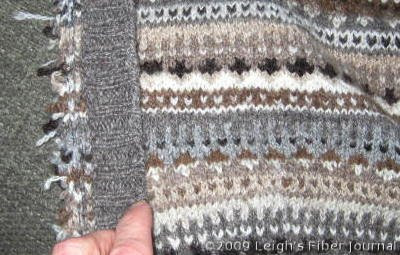 nice buttons, Leigh - very fitting for a kind of celtic inspired garment:) I cleaned up the edges on my one and only "cut" cardie the way you did - and so far I didn't receive complaints from the wearer that it doesn't hold...enjoy wearing your knitting - after all the work you put in! and thanks for explaining it all so well on the blog. Love the buttons! They are so perfect with the colors you used. I can't wait to see the finished sweater. Lots and lots of pictures, please. I can't wait to see it on you!!! You're almost there. I really like the buttons. Lovely! & a comment on steek-tidying : a knit facing can add a lot of bulk. Sometimes that's good, sometimes it isn't. I confess that I was questioning the buttons! It took me forever to pick them out and even then I had doubts. So thanks to everyone who complimented them! Very encouraging. Woolly Bits and Cynthia, I very much appreciate your comments on finishing steeks. I've just finished up the sleeve steeks, and so far I'm happy with the overall results. Photos soon. Sue, be sure to let me know what you end up doing with your steeks! I, too, vote for the buttons. Wonderful to see the finish line so near!! Yup! I loved the buttons too! I think the whole thing will be fabulous. Love the buttons and can't wait to see the finished sweater.